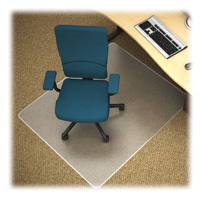 These chair mats work well on medium pile carpet and allow you to roll freely while protecting your carpet. Clear vinyl medium pile chairmats are affordable and come with a lifetime warranty. Protects carpet and allows easy chair movement. These medium pile carpet chair mats carry a lifetime warranty against cracking or breaking.